this was a BIG project. big in scope, big in designing time, big in fabrication time, big in materials, and big in just general AWESOMENESS. it started with the patron's broken platinum and chocolate diamond wedding band, unworn for several years. i don't commonly work in platinum because it requires an almost completely separate set up. we decided the rework involving the platinum would just use cold connections and as much of the platinum as possible. two large platinum pieces were formed and then drilled in preparation to rivet 14k rose gold bars. another band from the original platinum ring had a tiny four word inscription on the inside of the band. i flush set the four platinum bars and the chocolate diamond within its platinum setting in a thick sterling silver band - using just about all of the original ring's material and reworking it to a completely new artistic piece. then it was decided to add a beautiful and breath-takingly large vintage diamond originally from the patron's grandmother's wedding band to the newly designed stack. i removed it from a very traditional 14k white gold prong setting and designed a modern and warm 14k yellow gold ring that really showcased it's amazingness. bringing these beautiful elements from the past and present, the patron desired to incorporate a representation of looking forward and had her eye on watermelon tourmaline due to what it encourages and represents. we found a crazy stellar stone after several weeks of searching - one that held the colors and details she saw in her mind's eye. 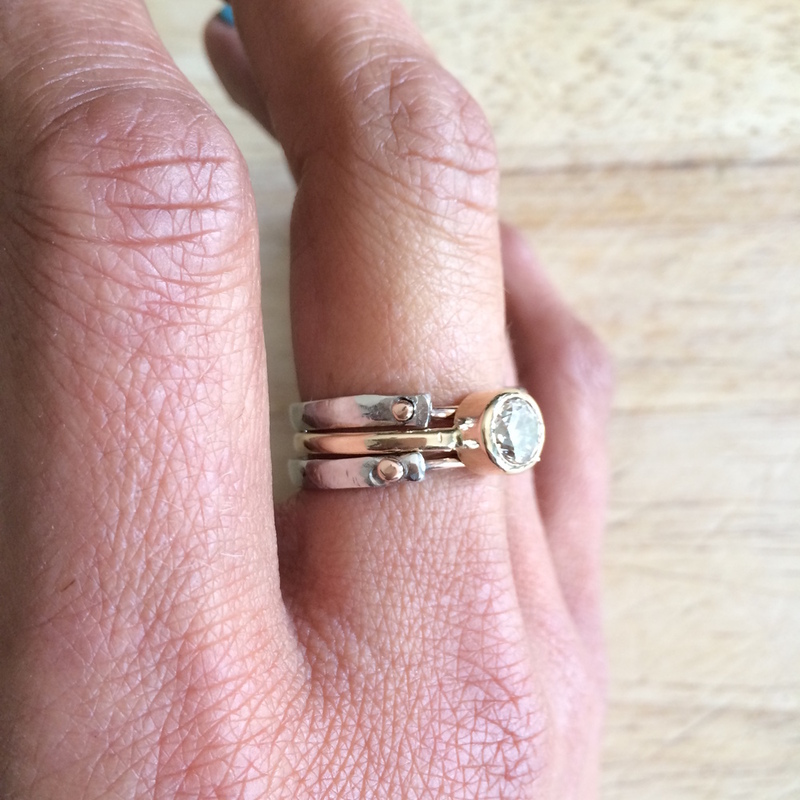 i built a solid 14k gold setting and band similar in simplicity and strength to the vintage diamond setting of this custom set. it's one of my most favorite of all time rings. really, the whole set absolutely excited me - individually and all together. and the options to mix and match, wear pieces solo or in various configurations. a true joy to work with and on. my art and my passion i absolutely take to heart, and i'm thankful to have the opportunity to work with my clients on custom projects. mil gracias! Watermelon Tourmaline works with the Heart chakra, cleansing and removing blockages. It can help to inspire both creativity and practicality, and connects the Heart Chakra to both physical and spiritual vibrations. It calms overactive emotions and is also believed to help attract love and resolve issues in relationships, infusing them with joy. Watermelon Tourmaline is wonderful for connecting with nature spirits and the Earth. It aids those who find themselves feeling disconnected or otherwise out of sorts. It can help to lessen depression and mend emotional wounds by allowing the owner to see the meaning for certain events in life. Meditation with Watermelon Tourmaline can aid in the release of unhealthy patterns of behavior, making room for new ways of thinking that lead to a more complete life. In general, Tourmaline can become electrically charged as a result of heat or pressure, which is a testament to the ability of these crystals to impact ones energy field. Tourmaline is very grounding and helpful in releasing stress and tension. They can bring inspiration from higher realms into the chakras for processing within the body. All Tourmaline is thought to balance yin and yang energies, as well as the left and right hemispheres of the brain.